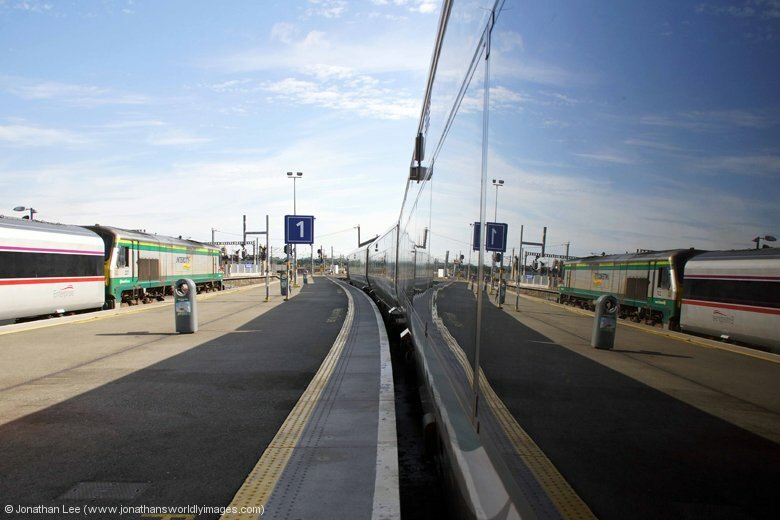 Once platform 7 was displayed there was a mass movement of people down by the taxi rank to the bay platforms at the top end of the station; movement ended at the ticket barriers though as they wouldn’t let anyone’s ticket through! Some guy eventually reset them and then the mad dash down the platform commenced. 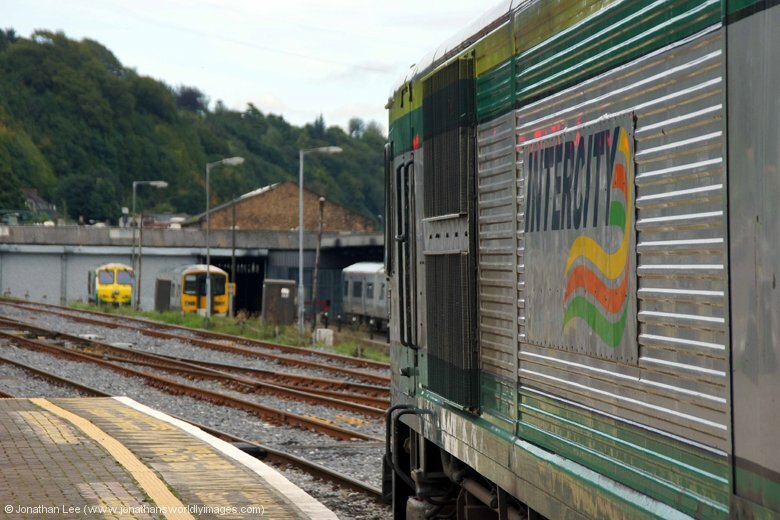 The train looked pretty wedged and our coach had names in all the reservation displays; we shared the coach with a large group of bowling folk, who were travelling back to Cork. GM #220 was at the head of the 8 coach set and both 232 & 234 were seen on the shed as we departed, as well as a long line of orange 201’s and few 071’s that all looked demic or stored. 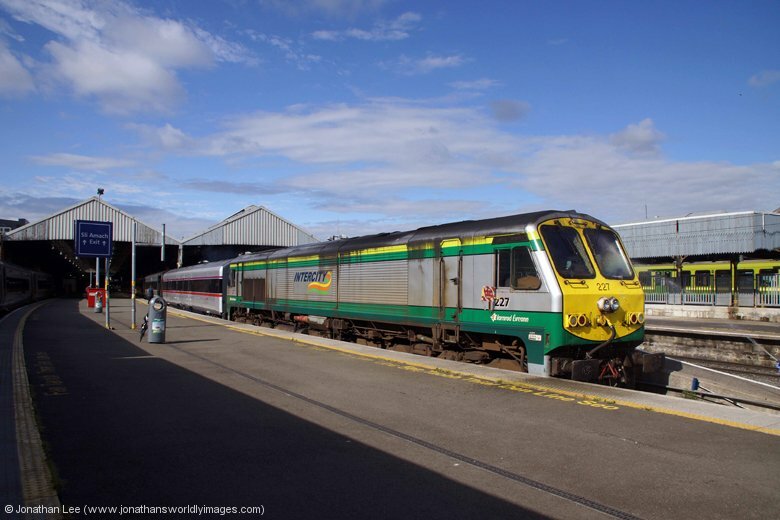 Having has a morning of sightseeing that took in the Shandon Bells and Cork City Gaol, among other things, we arrived back at Cork station with about 20 minutes to spare for the 1220 Cork – Dublin, which had GM #234 bolted to the rear. 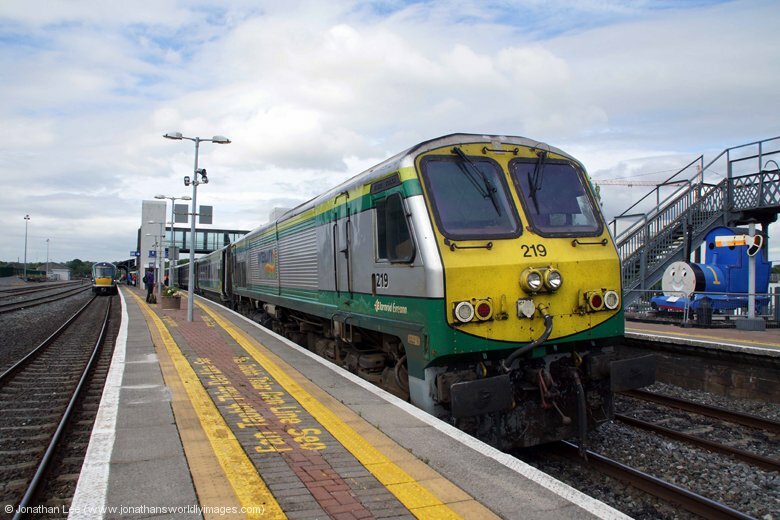 En-route to Mallow the old guy in the next bay, who was clearly a crank, decided go show me his working timetable; when he’d spotted me reading my Irish Rail diagrams. 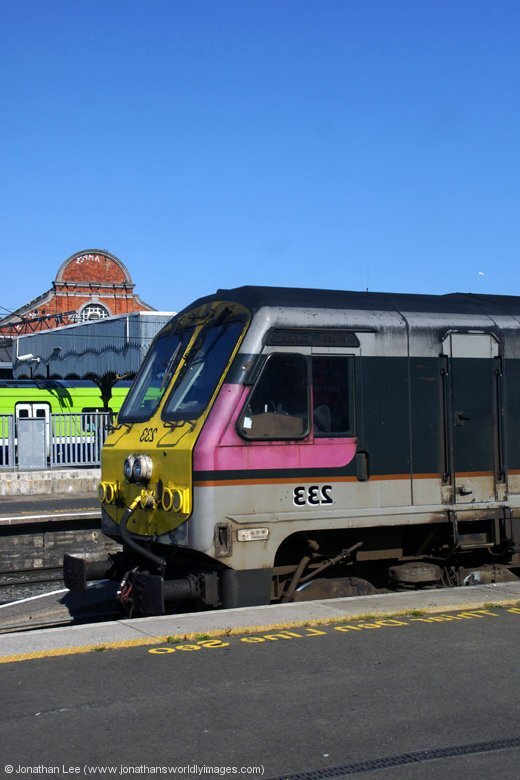 I used his local knowledge to my advantage though and he got on the phone to a friend of to confirm that there was still currently only one loco-hauled diagram on the Dublin – Belfast Enterprise services. 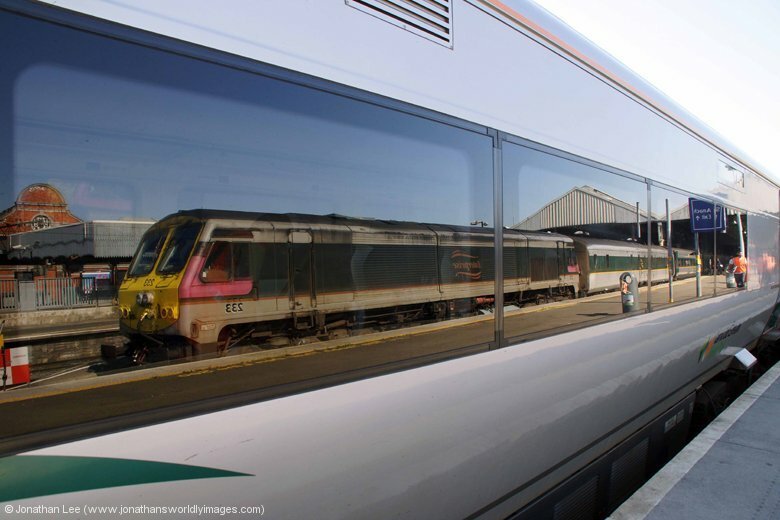 Thankfully it seemed it worked the 0800 Belfast – Dublin and 1100 Dublin – Belfast; which were the two trains we’d be using on this trip so hopefully that gen would be correct! 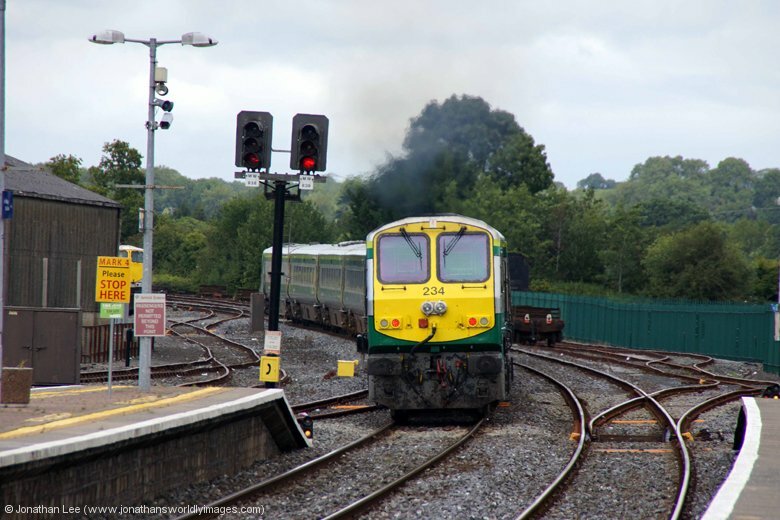 079 was outside the shed at Mallow and makeshift Thomas & James on the platform, looking a little worse for wear. 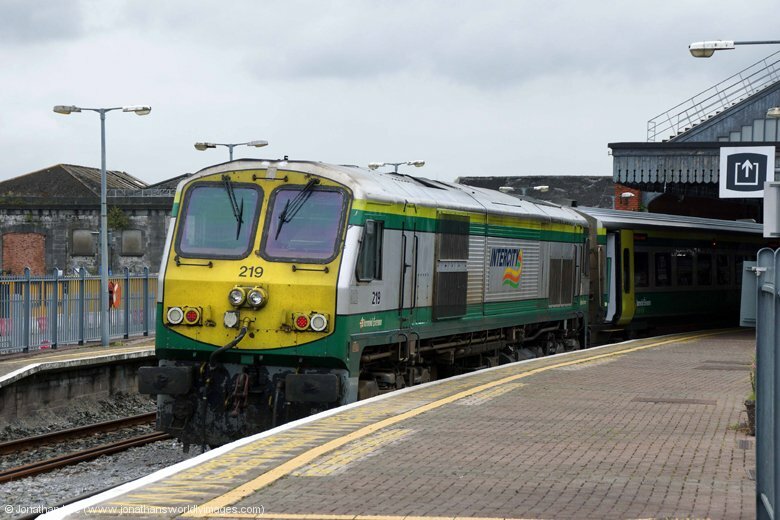 Our 43 minute fester flew by and if we’d been on the right platform in the first place it would have saved us a run when 220 arrived with the 1100 Dublin – Cork; which clearly hadn’t stuck to diagram and worked the 0800 Mallow – Cork & 0920 Cork – Dublin like it should have done. 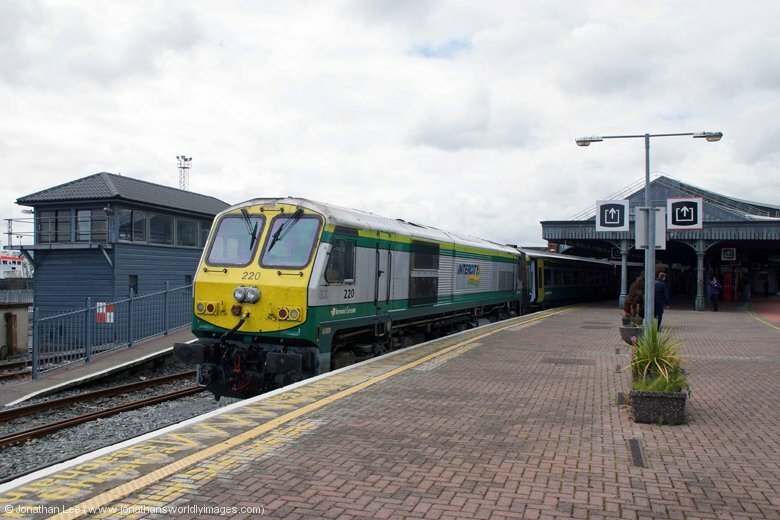 It turning up on the train it had threw my next planned Mallow move in the bin and it meant we needed to do the 1620 out and not the 1820 to cover the two diagrams that I’d not seen since we’d arrived into Cork the previous evening. 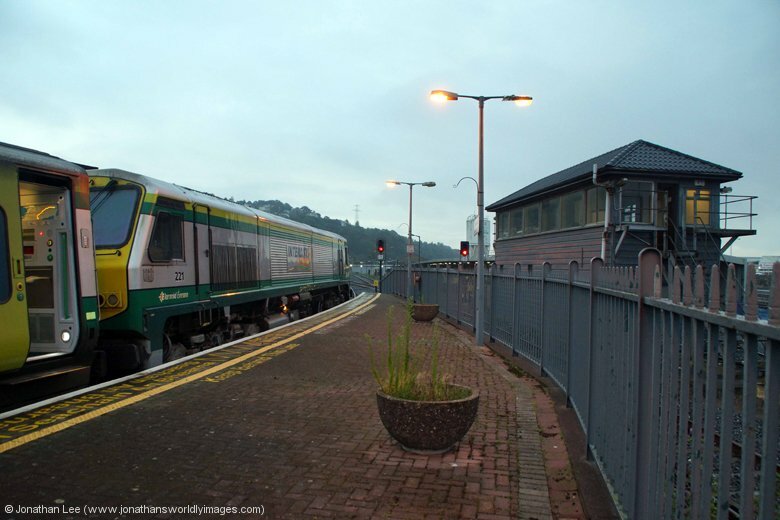 Back in Cork we had grand plans of going to look at Blackrock Castle and we even found the right bus stop for the #202 bus which takes you there; which is on the opposite side of the road to the bus station, by the River Lee. Due to the fact that it was total gridlock by the bus station, thanks to a bridge closure, the #202 bus we were waiting for basically made it about 100ft while we waited. After 5 minutes we gave up and went into the shopping centre over the road for something to eat instead, before ultimately heading back to the station. 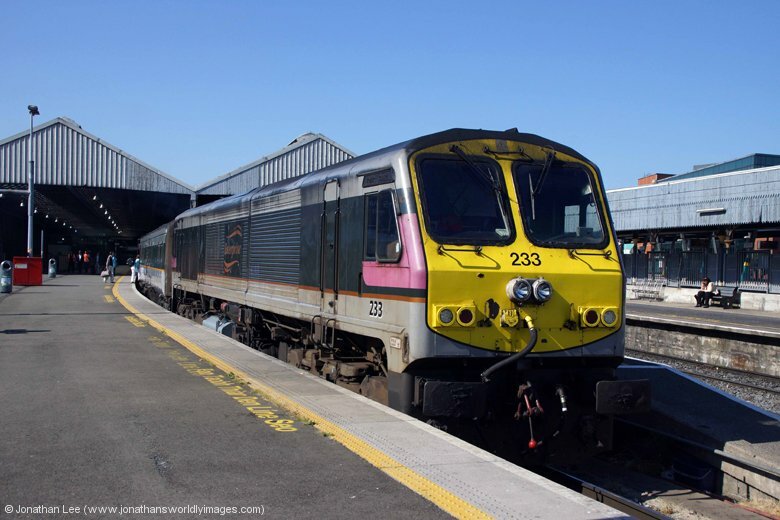 GM 219 was on the rear of the 1620 Cork – Dublin and I managed to spot a spare engine on the shed, which was 223. It as sunnier at Mallow during our second visit and we even managed to spot Blarney Castle, hidden behind the trees, while on the way for the second time. 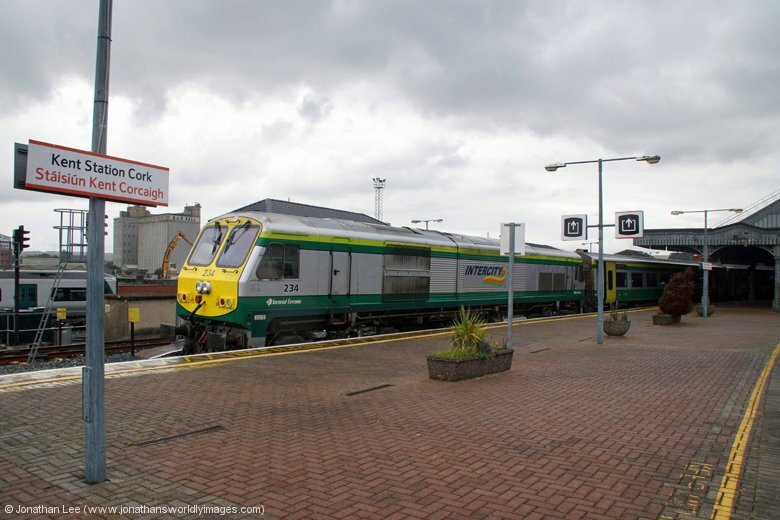 232 was a little late with the 1500 Dublin – Cork on the way back but was early into Cork, with all the recovery time the trains are given into Cork. It was quite a nice 15 minute walk from the station to basically St Fin Barre’s Cathedral, where almost directly opposite is an Italian restaurant called La Dolce Vita. The place was almost empty but for a family of six, who definitely kept the chef busy. Our pizzas were speedily prepared and well presented but it was a complete farce trying to cut them with the massive knife we’d been given. The food was ok though and nothing was left on the plate, other than the very large red chilly that had topped my pizza! 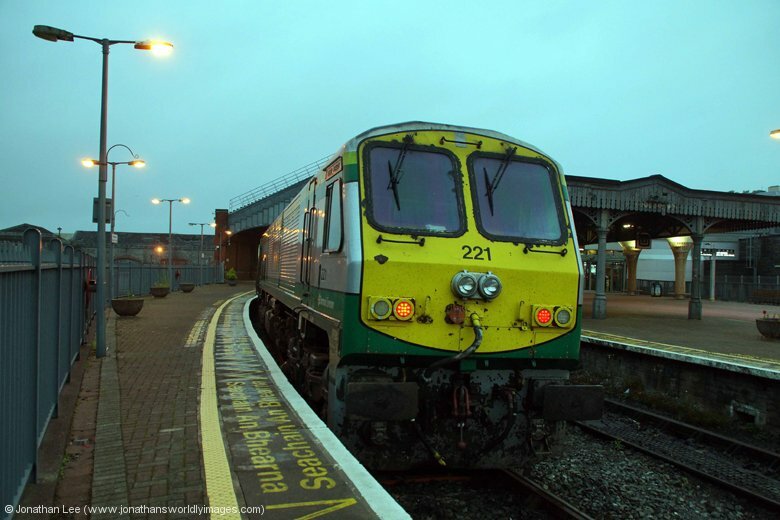 GM 221 was already in platform 5 at Cork Kent station when we got there, forming the 0700 Cork – Dublin Heuston, and there was plenty of room on board when we joined. 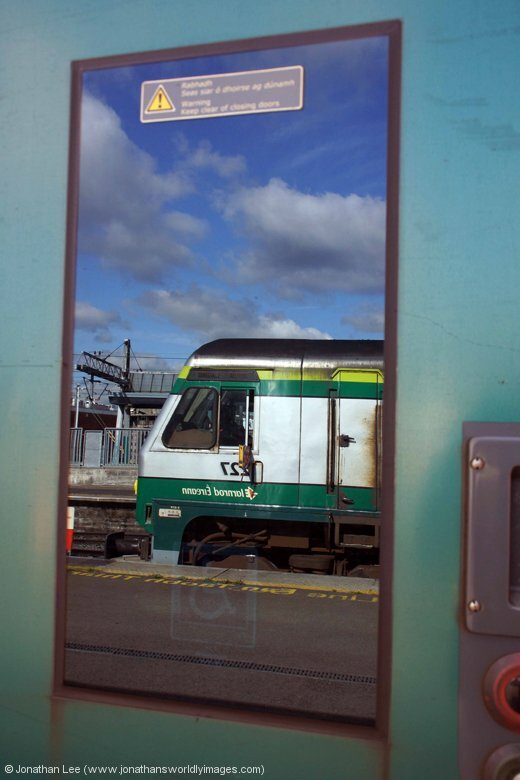 By the time we’d left Mallow the train was quite full and we’d inherited a bay full of children next to us that kept messing around with their mobile phones, trying to play video out loud to the whole coach. It took two attempts to stop this and a threat of telling the kids parents, who were sat further up the coach, who ultimately dealt with them when they all fell out anyway! 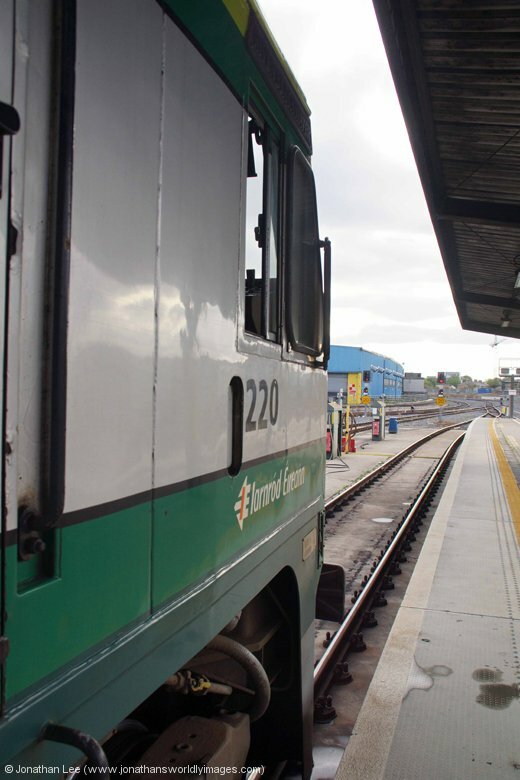 Some much needed food was gathered at Connolly, from a Subway outside, thanks to breakfast not being up to much and most of it being binned. 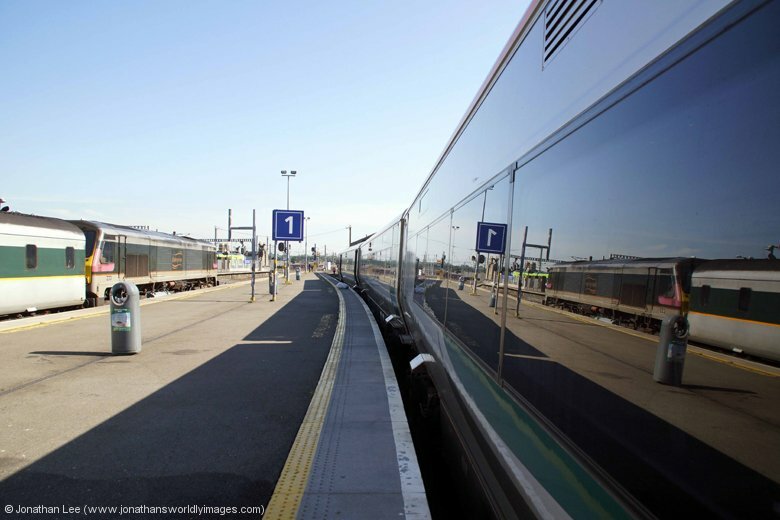 The Enterprise trains from Dublin Connolly to Belfast Central depart from platform 2 and the set to form the 1100 to Belfast was in by 1015 but nobody was allowed to board until 1045 with the platform cordoned off and everybody directed to wait in the dedicated Enterprise waiting room. A nice pictorial history of the Enterprise services and how the line from Dublin to Belfast was constructed is mounted on the wall in the waiting area, which should probably have another chapter added soon as the Enterprise sets are currently going through a refurbishment program; the result of which is only one Enterprise set being in service while the others are away and the other two diagrams being worked by units instead. 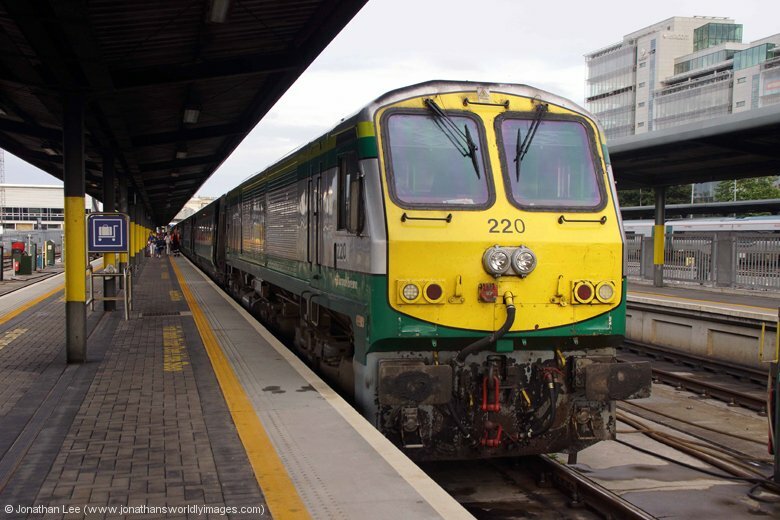 What I didn’t realise until I picked a timetable up was that the diagrams for each set are clearly visible in the timetable based on what is says about the services offered on each of the Enterprise trains; it’s evident that the only loco-hauled Enterprise train at the moment is the 0800 Belfast – Dublin, 1100 Dublin – Belfast, 1405 Belfast – Dublin & 1650 Dublin – Belfast Monday to Saturday and 0900 Belfast – Dublin, 1200 Dublin – Belfast, 1605 Belfast – Dublin & 1900 Dublin – Belfast on Sundays. 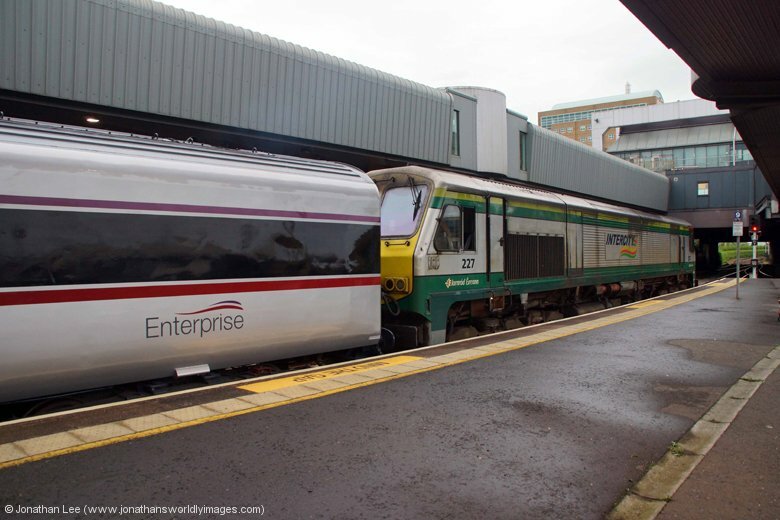 Thankfully the booked Enterprise set was sat in platform 2 waiting to take us to Belfast and I found GM 233 at the leading end when we were allowed onto the platform. An afternoon of sightseeing, in the rather nice Belfast sunshine, followed our hotel check-in, taking in most of the main sights and finishing up at the Crumlin Road Gaol; which is well worth a visit. Food for the evening was sought on our way back to the hotel at Safa Indian restaurant, which was only a short walk from our Ibis hotel. The guy serving us was from a place called Phagwara in Punjab; this was randomly a place I’d set foot in only 5 months earlier when on a trip to India; needless to say he was keen to hear about why I’d been to this non-descript place in Punjab! The food served was piping hot, very tasty and there was plenty of it; we left Safa very full and certainly not needing any desert! Having stopped off at Dunluce Castle on the way to Giants Causeway, rather than head straight to the causeway we opted to walk the 300m from the bus stop to the nearby Giants Causeway & Bushmills Railway, which operates trains over a 2 mile section of old tramway, which only now runs to Bushmills and not all the way through Dunluce as it had back in the day. The railway is 3’0” gauge and I’d been expecting a small steam loco to turn up with the train and was a little confused when it didn’t. It turns out that the railway wanted their train to look more authentic and had a small diesel engine built, which was housed in a body shell to look like one of the old tramway cars; one the guy in the booking office had pointed a picture out to me I understood why as the trainset now used looks almost identical to how it had historically. Number 8165 had been built by Severn Lamb Ltd of Stratford on Avon in July 2010 and did what the railway needed of it. 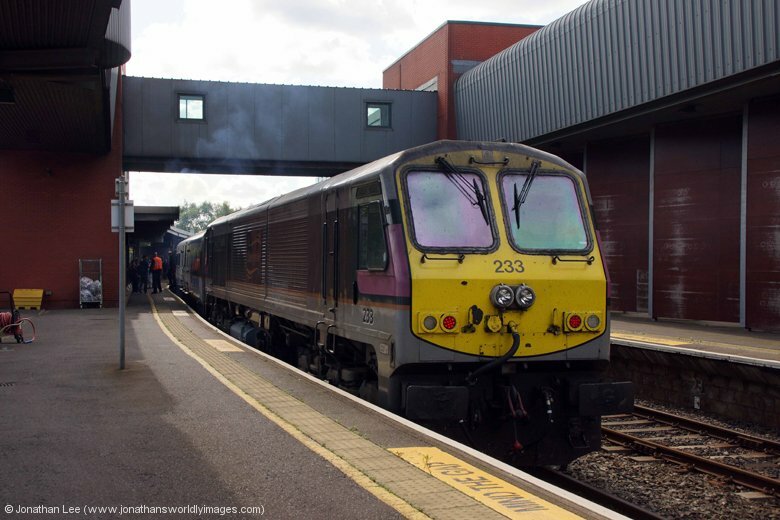 Round trips of the line cost £5 each and to be honest it was a welcome respite from the rain; although the cars could do with some internal heating! 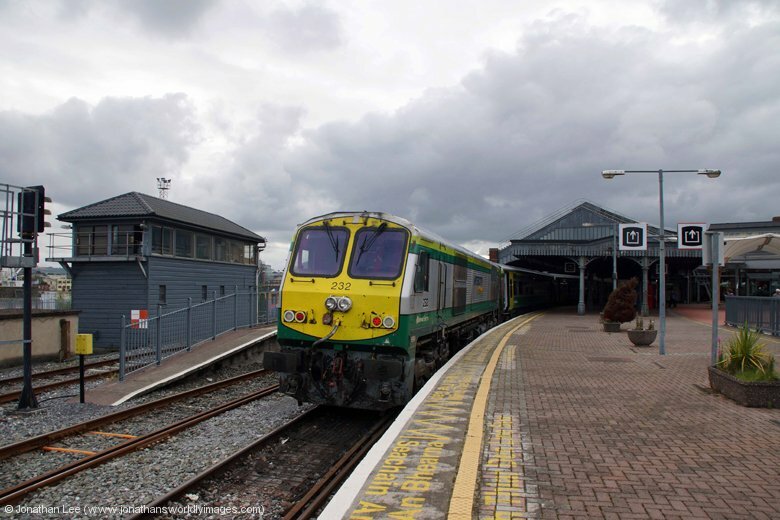 If we thought we were cold and wet though the poor guy who had to stand on the front veranda of the leading car, as the train headed to Bushmills, had definitely drawn the short straw that day bless him! After a wet walk to the Giants Causeway we caught the bus back to Portrush and our No.402 bus was a little over 10 minutes late when it turned up and the connection at Portrush for the train was only 15; and only 10 at Colerain! There was a bit of make-up time towards the end of the schedule though. 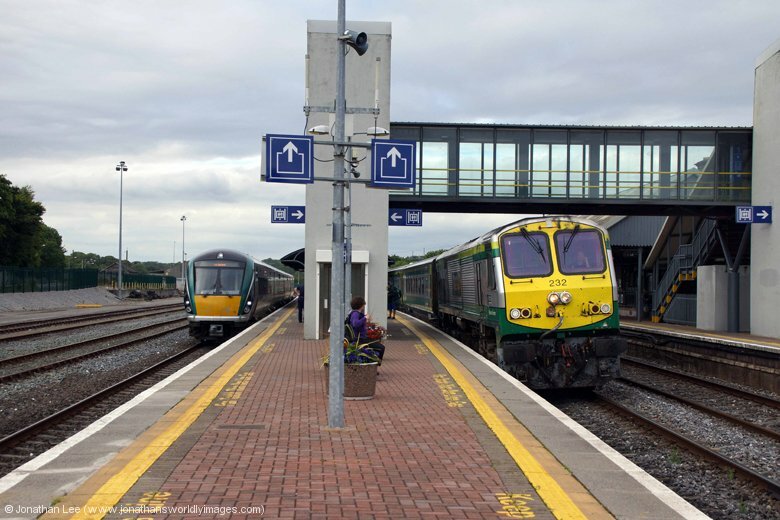 When we arrived into Portrush with 5 minutes to make the train we made a bid for it and rushed to the station, making the 1505 train back to Great Victoria Street with only 2 minutes to spare; which had the same guard on board as the 0810 train we’d done out that morning. 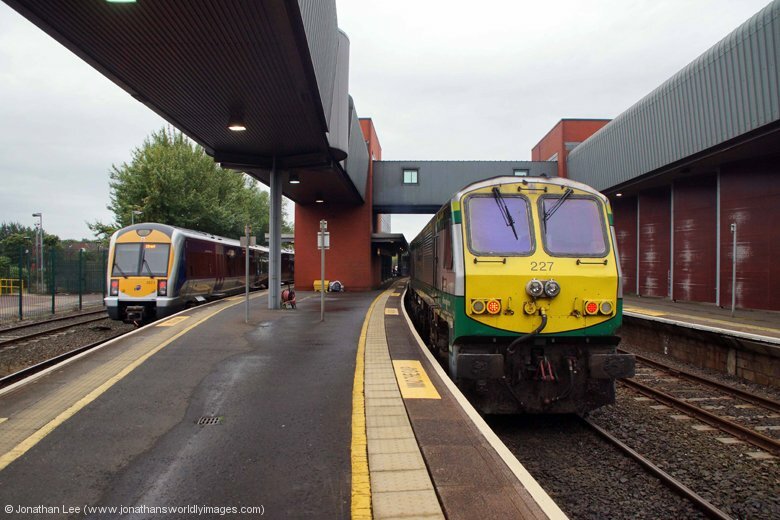 We had a choice of trains to get us from Great Victoria Street to Belfast Central, as opposed to walking with our big bags, and having called at Tesco’s for breakfast we managed to just make the 0718 round to Belfast Central; where GM 227, an Intercity sector one and not an Enterprise one, was already sat in waiting to depart with the 0800 Enterprise train to Dublin Connolly. The set had the same driver trailer as we’d had up two days previous but a different brake as it was in the new livery and looked refurbished. The journey was harmless but for the annoying kids that wangled their way into the bay next to us, who eventually got the message about not playing video’s out loud on their telephones!